I am a young Beagle but sadly, I don’t quite remember what happened to me and don’t have any record of my past. One day, out in the cold weather, a kind lady found me unconsciously lying on the road. She took me to the vet and there, they kept my body warm and treated me with some special medications. After few days I was able to eat and feel alive again. But… something was different. My legs! I couldn’t feel them anymore. I was paralyzed from the waist down. The Vet and the rescuer were not able to keep me any longer and they wanted to put me down. 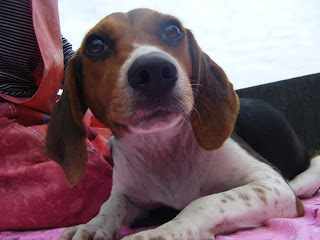 But the kind lady who rescued me decided to call Animals Taiwan and here, they saw my eagerness to live and become the energetic Beagle I was born to be and they took me in. My paw-friends here said I am a sturdy, hardy little hound girl. I am still in the quarantine room until I take all the necessary shots. The Vet also noticed that my legs are somehow looking stronger so they started to treat me with acupunctures and special shots between my paws. They hurt! I hate needles! But I know they are trying to give my legs back so I can again run around happily like a real hunter, full of stamina. I will also receive my wheelchair very soon! Hurray! I am just so happy to be alive! There are few paw-mates here in wheelchairs too. They told me they were hit by a car. Probably, that is what happened to me as well. I don’t know exactly how old I am. I was brought to Animals Taiwan on Jan 15th 2010 so this is my new birthday date! This is when I first felt loved and cared. This is when I start living…..